During a recent leadership training programme, I posed the question: “What is the main driver of success for any organisation?” You can imagine the range of answers I got. “It’s about having an amazing product that is different,” said one. Another offered: “It’s all about having great people”. A third person declared “an efficient supply chain” to be the secret to success. While others gave answers such as “great service”, “lowest prices”, “clever marketing”, “a clear strategy” – I simply nodded in agreement, supporting every answer. The reality is that all of these answers are perfectly correct in varying proportions, depending on where the organisation is at in its evolution. It also depends on the competitive environment, the market and changing customer dynamics. But what is it that binds all of these concepts together? There is something needed to ensure that each of these initiatives is executed effectively. I strongly believe the common denominator that determines the success or failure for any organisation, is its culture. Vision and mission describes ‘why’ an organisation exists. Strategy outlines ‘what’ should be done and ‘when’. Structure details ‘who’ will do whatever. But it’s the culture that shapes ‘how’ things will get done. 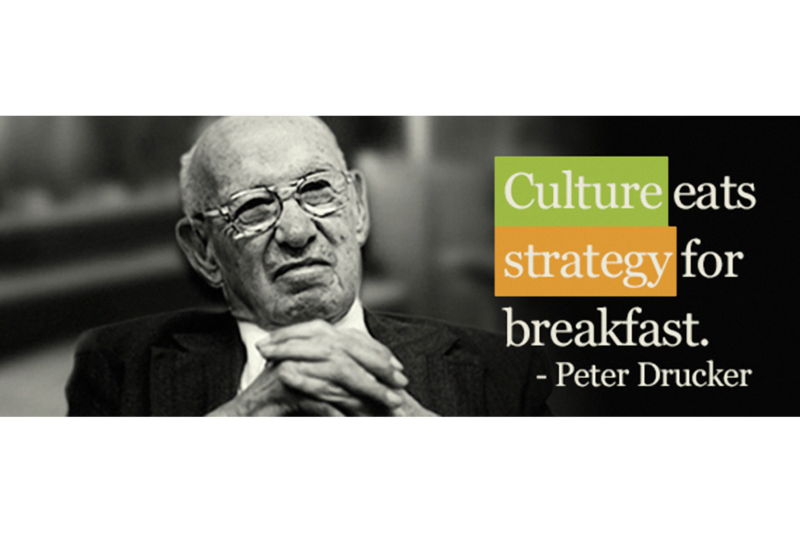 As management guru Peter Drucker famously said: “Culture eats strategy for breakfast. In corporate language, culture is often defined as ‘the way we do things around here’. You and I can read the culture of an organisation from how it interacts in the media, with customers, suppliers and its own people. Take Ryanair for example. It has a very strong culture shaped by its leadership which divides opinion. And how could we ever forget the relentless customer-centric culture that defined Superquinn, particularly in Feargal Quinn’s time? There are few companies that can actually define their culture. Yet in my view, it’s the biggest driver of success or failure. It’s very encouraging to see huge brands like Disney attribute so much of their success to culture. They proactively defined their culture and continue to embed it right across their organisations. Within the definition of culture as ‘the way we do things around here’, there is a clue. Culture in essence is a combination of the behaviours of its people, the leadership style, the processes and the rules they live by. Culture drives consistency. A proactively defined culture impacts HR practices, engagement of your people, customer experience, marketing, all kinds of decision-making, internal controls – in other words, everything that happens in your organisation is shaped by your culture. This week, I was invited to kick-start a culture change project for a family based in Dubai. This company has been trading across the region for 70 years and has grown a diversified portfolio of companies in that time. Recently, they took time out to consider a new strategy to take them to 2020 and beyond. In doing that they gave a lot of consideration to the opportunities and threats in their markets. They also considered their own strengths and weaknesses, which helped them formulate a robust strategy document that has clear goals, accountabilities, metrics and dates. But with a level of maturity and openness, they acknowledged that their culture needs a reboot. As they examined past successes and failures, they came to the conclusion that those results were more to do with execution than the quality of the plans in the first place. Every organisation has a culture, whether you realise it or not. You may not be able to define it or even have planned for it. But you do have one. There will be elements of it that are good and elements of it that are holding you back. Firstly, conduct focus groups of your own people, customers and suppliers. Think carefully about what questions you want to ask. You need to address the softer issues such as behaviours, processes and leadership. Questions should be crafted to identify enablers and obstacles. Don’t use a generic one. And don’t select a partner just because of the software they use. Engage a company that helps you ask the right questions so that you get quality insights as a result. Use the feedback and insights to design a new culture, built on a set of values that respect the heritage of your brand, the ambition of the key stakeholders and the changes in your environment (such as competition, customer changing needs, employee expectations and so on). From supporting culture change projects over many years, I see recurring obstacles that emerge in culture audits. They include a lack of individual ownership and accountability, poor focus on customer, gaps in internal communications, inadequate internal collaboration and disrespect for people. Don’t take these as generic points as if they applied to you. Regardless of your size or industry, you need a culture that is relevant to your business. The devil will be in the detail. I encourage you to use an internal or external facilitator to support you in designing a culture that is right for you.